Scholars at Risk’s annual event, Student Advocacy Days, brings students and faculty from SAR’s Student Advocacy Seminars together for a hands-on workshop on advocacy best practices and strategies, followed by a day of advocacy on Capitol Hill on behalf of imprisoned scholars. Program: On March 7th, participants will spend the day learning advocacy strategies from government, NGO, and SAR staff. Past workshop speakers have included staff from the Tom Lantos Human Rights Commission, the US Department of State, the National Endowment for Democracy, and SAR scholars. Workshop sessions will cover ways in which different areas of government support human rights, and how to present cases during the following day’s Capitol Hill meetings. Students will prepare and practice their case pitches in mock meetings, and share experiences and strategies they have learned from their work in their Student Advocacy Seminars. Additionally, this year’s workshop will include a session for faculty on best practices for facilitating a seminar, including discussion of syllabi, class structure, and successful advocacy methods. 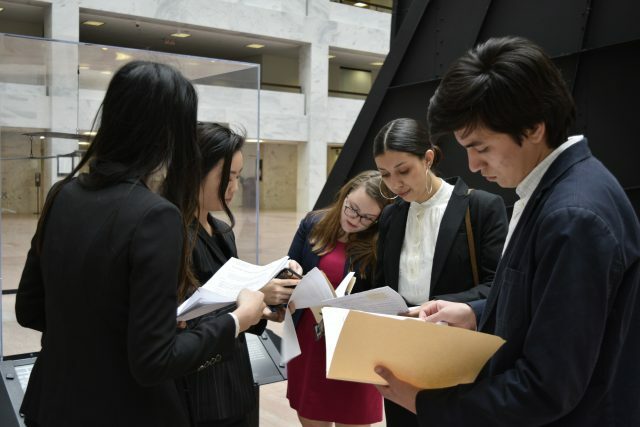 On March 8th, students will take their newly acquired knowledge and put it into practice by going to Capitol Hill and other relevant government offices to meet with elected officials. There they will present their case and discuss potential advocacy actions that officials can make on behalf of the scholar. Location: The programming on March 7th will take place at NYU DC, 1307 L Street NW, Washington, DC 20005. Students, faculty, and SAR staff will take meetings across Capitol Hill on March 8th. Participation: Student Advocacy Days is open to all faculty and students participating in a 2018-19 Student Advocacy Seminar, former faculty and student participants, and faculty interested in facilitating a future Seminar. Student Fellowship Opportunities: Limited funds are available to support student participation in the event as SAR Student Advocacy Fellows. Priority will be given to current Student Advocacy Seminar participants and students from Scholars at Risk network member institutions. If you are unable to attend, tune in through the live-stream of the event! Interested? Please complete this expression of interest form — it’s not a formal commitment, so don’t worry! Contact Alex Bell with any questions: alex.bell@nyu.edu.